The latest strategies, best practices, and news for lean manufacturing. In a recent Supply Chain Management Review study exploring the information and analytics needs of supply chain professionals, it was immediately clear that a new horizon is in view for supply chain professionals around the world. Leaders see the need for better tools—tools that do more than just provide data about where they’ve been. One of the most compelling research findings addresses the obstacles leaders face when implementing new supply chain analytics tools into their systems. Here’s a look at the breakdown of responses. These obstacles may feel too big to supply chain leaders, but the truth is they can be overcome with a strong strategy. Let’s dive into these obstacles and we’ll share recommendations for how you can overcome them, implement powerful, advanced supply chain analytics tools, and increase productivity and profitability. Companies usually have multiple systems as a result of acquisitions over time. It’s not uncommon to see companies with three, four, or even five different ERP systems across their sites. This creates a scenario in which executives see data in several different formats, with different verbiage for the same data points and reports that aren’t standardized. Securely connecting to each system presents its own set of challenges, but once connected, how do leaders ensure they’re getting the data they need to run the most effective analytics? At LeanDNA, we’ve spearheaded new ways to integrate data across multiple sites and ERP systems. First our software connects securely to any ERP, where it collects specific data sets that our system analyzes and prioritizes automatically to solve targeted problems. We’re not just organizing data; we’re organizing it in order to solve the most critical challenges. Information from all ERPs is presented to buyers, managers, and executives in standardized formats, which means everyone’s speaking the same language. The best part is, LeanDNA’s data integration process takes only about a week and requires no build-out on the front end. Our software does all the heavy lifting for you. There’s a close relationship between obstacles one and two. Because many companies haven’t integrated their data across sites, they’re stuck using Excel. With multiple ERP systems, business leaders are nervous about upgrading because it’s the only way they feel certain to get the information they can rely on. Large data dumps are prepared and run through manual macro processes so teams can trust the calculations. One of the biggest benefits for LeanDNA users is that we’ve been able to get them out of Excel for many of these manual processes. Analytics insights and reporting are available in a cloud-based platform that allows real-time collaboration. Teams no longer spend time collecting and preparing data; they’re now free to focus brain power on making strategic decisions that impact the bottom line. Issues and their root causes are identified ahead of time, and the software provides prioritized action lists to address them. LeanDNA is effectively ending the dependency on Excel for supply chains. Factories are dynamic systems. New parts, part changes, and supplier changes are just some of the ongoing adjustments that need to be made daily. Maintaining high data quality is crucial to any successful supply chain process. Most companies we work with are using reactive approaches that leave them scrambling to put out fires on a daily basis. Teams might tag an issue as data quality, but it’s not always easy to clearly identify the root cause. Is data missing? Is it inaccurate? Has there been a product change that hasn’t been accounted for? The LeanDNA solution prioritizes actions according to real business value. We’ve found that by separating out the top two or three high-value data quality issues and doing a deep dive into the root causes, 80 percent of the problems are resolved. The best part? It’s all done automatically with the click of a mouse. Most analytics tools are frameworks that aren’t purpose-built for manufacturing. There’s enormous expense associated with change management—new platforms, training, troubleshooting, and more. Businesses must hire domain experts just for their teams to use the platform and solve problems. Adopting supply chain analytics tools across multiple sites and ERPs could easily require millions of dollars of up-front investment. Completely purpose-built for manufacturing, LeanDNA uses prebuilt data models and analytics to identify and solve common supply chain problems every day. We’ve done all the front-end work for you, without the need for exorbitant fees or costly build-outs. You won’t need any new infrastructure or expertise. We’ve engineered LeanDNA to work straight out of the box for just a simple subscription fee. Most modern manufacturers’ ERP systems are five, 10, or even 20 years old. Given the age, they were never built to be prepared for the added complexity of modern manufacturing or the new tools that have been introduced. Leaders have rightly believed that their systems simply aren’t equipped to provide advanced supply chain analytics. LeanDNA’s cloud-based software connects to any ERP with no additional infrastructure required. All sites and systems feed into one web-based application that’s as easy to use as an everyday web app. Buyers, suppliers, managers, and executives across the organization access the same information in the same standardized language that everyone understands. It doesn’t matter how old your system is—LeanDNA will drive improvement. 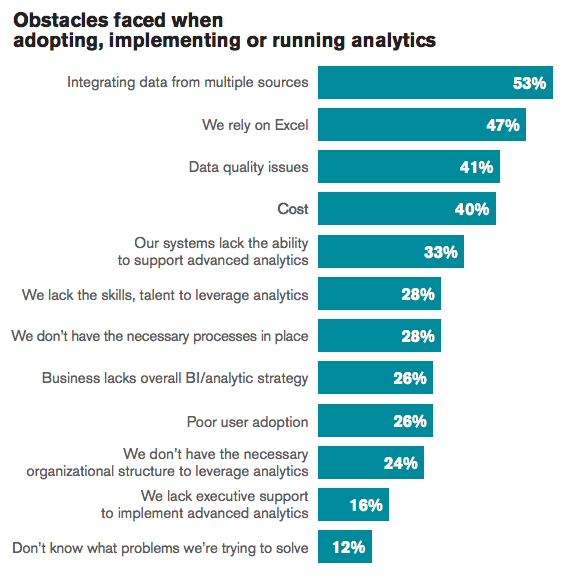 We found this study interesting partly because all top five objections to adopting advanced supply chain analytics tools had to do with systems or data. If there’s one thing we know for sure, it’s that manufacturers have lots of data—often more than they know what to do with. The key here is not that companies need more data. It’s that they need the right data to be easily available to the people who can make a real difference. LeanDNA is built with collaboration in mind. It’s easy to integrate and smart enough to help with common issues like data quality, while still as easy-to-use as an everyday web app. It eliminates the long work processes associated with data collection, preparation, and decision-making. And most importantly, LeanDNA brings your people together. When the best people leverage the best data, the results come quickly. Maybe you feel stuck—nervous about upgrading because of the high expense and potentially high downside due to all the work and training required. Charts and graphs provide no insight into root causes, and you’re left making decisions based on instinct. LeanDNA can help you get out of Excel, identify the most critical data, and make more profitable decisions every day.